For the past two years since my Dad was diagnosed, it's been a lot of waiting. My Mom would often say that cancer is mainly "hurry up and wait," because you're waiting for answers, waiting for treatment, waiting for doctors, nurses, people to tell you what to do and how to do it. And then later on, when we knew there wasn't much else we could do, we waited to say goodbye. I'm not sure which is worse, watching a loved one suffer through pain and agony, or losing someone suddenly. I'm still not sure. The last time I saw my father was a day and a half before he passed away. Hank was out of town, so I had to head back home with my kids, and planned to come back down Sunday to stay the next week with my parents. I was well aware that every time I said goodbye to my father it may be the last. This wasn't our first rodeo. Over the years my Dad had been in and out of the hospital for various things, usually heart-related, so I knew the sadness attached to leaving him while he lay ill. But this time it was different. The boys said their goodbyes, asking about the snack bags my Dad would always make them. This time there would be no snack bags, as my Dad was bed-bound and could barely grasp a tissue. I had the kids say goodbye, I started the car, put them in, and had my Mom go out with them so I could spend an extra few minutes with my father. At that point my Dad's voice was barely audible- his words were mumbled and came out in a whisper, and when I leaned in to give him a hug he grabbed my arm and had me look right at him. His blue, watery eyes were piercing. I never remembered them being that blue, and when I had asked him about that the week prior he told me the color was from all the tears he'd been crying- they washed away the hint of green-grey that had always been there. His bright ocean eyes locked into mine, and his small voice got stronger for a moment. "I'm not going to see you again." I told him, oh sure you will Daddy, I'll be back in less than 48 hours. He shook his head like a small child would and told me again, no, no you won't. He asked me then to give him a long hug, and if I would lay my head on his chest. It must have been just a few minutes but it felt longer. 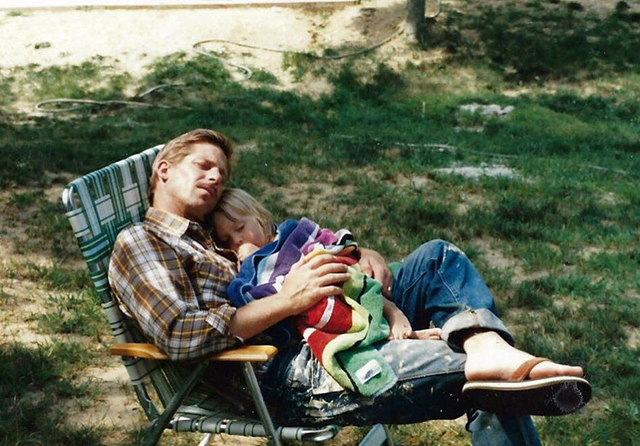 I tried to take it all in- I imagined I was 3 again laying on my father's chest. He was big and strong and nothing could hurt him. He was invincible. I closed my eyes as the tears squeezed out of the corners but still I didn't move. I didn't wipe them away. I remembered being tiny and young and I allowed memories to quickly wash over me, my thoughts bobbing up and down in the waves, old forgotten things coming to the surface. The beach in New Jersey. Sandy peanut butter and jellies. My Dad holding me up in the water, the sunlight in my eyes. Apple cider and donuts, pumpkin patches and scarecrows. Riding in the car on the highway, picking up Chinese food and cardboard boxes of water. Suitcases and big windows and waving goodbye. Switlik Elementary and Wawa subs and soccer practices. Bright white thoughts rolling in and out as I lay there listening to his labored breaths. I was 3 years old and my Dad was strong. I was safe and nothing could hurt him. We had our whole lives ahead of us. I got up and kissed my Dad's cheek, his head, his hand. I said goodbye and I really believed Sunday would come and I would be able to have another goodbye. His eyes told me differently though, and as I walked out the door and looked back, he turned his head into his pillow. I could hear him softly crying. When my Mom called me Sunday morning and told me my Dad has passed away in his sleep there was a deep, hollow ache that began to grow. A pit in my stomach I could feel in my throat. It was hard to swallow. Now two weeks later it's still there, a part of me now. If I stay busy I forget about it, but the moment I'm alone with my thoughts I remember, and I can feel it. I miss my Dad terribly. I know it won't ever go away, and even just two weeks later I can see all of these spaces where he should be. So now I am waiting again. I wait for the moments I can feel him, in the cool breeze before the sun goes down, or the sound of the wind in the trees. I wait until it's late and everyone is asleep, and I can look up at the ceiling and talk to him. I wait to go on walks in the morning and long runs at night, and listen to his favorite songs and remember all of the things he loved. I read somewhere your grief never goes away, but your life gets bigger, so your sadness doesn't feel as big. Beautiful tribute to your Dad. I don’t know you or your family, but I’ve been following tour blog since you had Henry. I recently just had my first baby, and as I sat here rocking her and reading your tribute, I cried my eyes out. Just a very beautiful, touching reminder of how brief life is. And I’m so sorry for your loss. Hugs to you. I lost my mom 6 years ago to cancer.. 4 months after I suddenly lost my aunt to a heart attack. There is no good way to lose someone... with my aunt, I never got to say goodbye, tell her how much she meant to me. With my mom, I got to say it all but watching her deteriorate and be in pain day in day out, changed me at my core. You are right, the pain does not go away. It manifests itself differently over time and sometimes catches you off guard or at odd times... sometimes it's a song, sometimes it's a smell.... milestones with my kids are very hard knowing that she would love to see them grow... I like to see that she is seeing it and getting a kick of just how much like her I am even tough I always swore that I would be different. Literally in tears. So beautifully written. I'm so sorry for your loss. So beautifully written Dani. This brought tears to my eyes. Thank you for continuing to share your writing on this blog. And so sorry for the loss of your father. I'm with you in your pain! I can't imagine how hard everything is. But feel fortunate for all the moments and love you were able to share. That's most than some people can ever dream. There’s a sweet children’s book called “That’s Me Loving You” and it brings me so much comfort to remember the words when I feel the ache of missing someone I’ve lost. Beautiful words of your beautiful father from his beautiful daughter. My Dad died of cancer two years ago. I saw him the week before, and hugged him and told him I loved him. When I spoke to him 3 days later on the phone, I wondered if I would talk to him again, and it was a hard and sadgoodbye. I did get to see him on his final day, and kiss him, hold his hand and tell him how much I loved him and thanked him for being loving us our whole lives. I think though that for some time it takes your heart some time to heal. For most of us we are deeply traumatized by the dying , the goodbye is hard, and the it is difficult to remember them without crying. Now though I don't often cry, when I think of my dad I remember the love, the good times and the great life he had and the fun times we shared. I think now that I was lucky to be able to help my dad in the last few weeks of his life. Just as our parents helped us as babies and children, it is a gift to be able to help them on this final journey. Such a beautiful and touching tribute to your father. My papa (who raised me like I was his child) died suddenly 12 years ago and I still miss him terribly but he will always live on in my memories and photos. My heart breaks over this. I needed this reminder. Thank you so much for sharing. My heart is so broken for you, friend. This was so beautifully written. Thank you for sharing this. You are so eloquent. As I am suffering with grief from losing my grandparents, I really appreciated reading this. It's what I have been thinking but am not as good of a writer to say. Prayers to you and your family. This really hit home for me. I lost my Dad 3 years ago this past April. I miss him tremendously. It’s a loss that I’ve never felt before in all my life. What I wouldn’t give to have him back. To sit and talk with him. Laugh. Tell funny stories. To have him see my kids grow up. To meet his last grandchild. So many things that can never be anymore. I know he’s still around. I sometimes smell his cologne out of nowhere. On the anniversary of his passing I was in my car alone going to grab some food for dinner and I thought gee, I would’ve thought today of all days he would’ve given me a sign. At that moment his favorite song came on the radio. I started crying and pulled over. He was there. He’s always there. Your Dad too is always there. Beautiful. Heart breaking. Hugs to you and your family. My heart is breaking for you and I'm crying tears for your family. Keeping you all in my thoughts during this difficult time.